Localization of Online Designer and WebReport - Fast Reports Inc.
Report Localization is very urgent task in a Web environment. Because your site can be visited by people from different countries. Fortunately, FastReport.Net has many localizations in different languages, and we can use it. Let's look at how to do it on the example of MVC application. WebReport webReport = new WebReport(); //create instance of WebReport object. I'll pass value from the dropdown list into the method Index - one of the two languages, Russian and English. In the first line we create an instance of the object WebReport. Then, set the width and height of the web report. Write down the path to a report in the variable report_path. Create a data set and load it into the database xml. Then register the data source in the report object. Now load the report in WebReport object. Check the value of the parameter language. 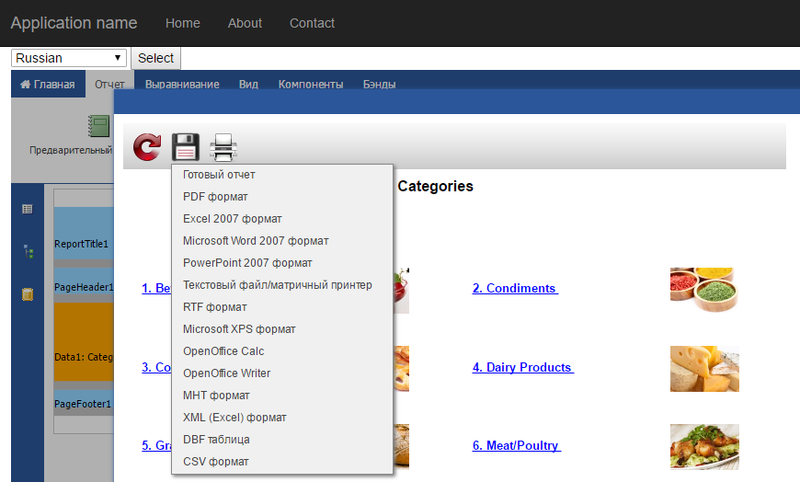 If it is "ru", then set the report localization and localization of online designer as the Russian report. Otherwise there will be an English localization. DesignReport property enables online report designer. The report, that we loaded above will be opened immediately in the designer. It remains to pass the Web report in the View. You probably noticed that the localization of the report is taken from the Localization folder. You can find the folder with the locales in the root directory of the program FastReport.Net. Add it to your project. Also, you need to add online report designer into your project. You need to build it using a special online constructor in the client panel of developer’s site www.fast-report.com. After assembling you will receive the archive with the designer. Add WebReportDesigner folder to your project from the archive. Here we set the page title. Then, use BeginForm helper to create the form. We specify controller and action method in it. Inside the form we have created a drop-down list and fill it with two elements. Note that the Language list name is the same as the name of the parameter in the method Index. Also, here there is a button with which we accept the selected item. Finally, we display our report via @ViewBag. I showed a simple implementation of localization with the choice of language from the list. To automate the choice of locale, you can determine the user's browser language with the property Request.UserLanguages.